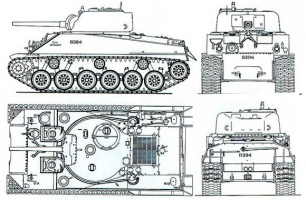 Der M4A2E4 Sherman ist ein amerikanischer premium mittlerer Panzer der Stufe 5. Die Entwicklung dieses Versuchsfahrzeugs im März 1943 begonnen. Zwei Prototypen wurden bis Juli fertiggestellt. Trotz erfolgreicher Erprobung wurde das Fahrzeug nie in Serie produziert oder eingesetzt. It is currently not available from the in-game store. This tank was awarded to players who managed at least 1,000 battles during Beta testing. It is essentially a heavier variant of the M4 Sherman. It sports decent mobility and a relatively acceptable gun for its tier, which has no problems penetrating light and most medium tanks but will struggle to penetrate heavy tanks. 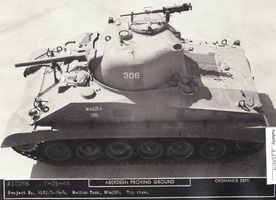 It also has straight-angled hull armor instead of the more rounded hull that the M4 Sherman has, potentially resulting in shells bouncing more frequently. 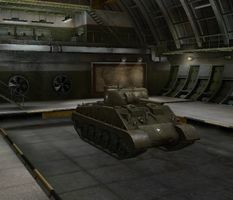 The tank was given to beta testers on the NA and EU servers as a reward and is not currently available on those servers. It was available on the SEA server as part of a monthly mission reward in October 2014. It is only available for in-game purchase on the RU server. The performance of this tank is comparable to the T14, though the T14 has better all round armor at the cost of reduced mobility. Like other premium vehicles, the M4A2E4 is a good moneymaker and a pleasure to drive, unless assigned in high tier battles where the lack of penetration of its gun becomes obvious, and it often is. Unless it's in the top tier, this tank is most effective when supporting other tanks. 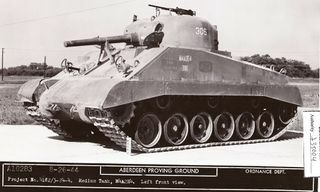 M4A2E4 tank was part of experiments made with different types of suspensions which led to the adoption of the HVSS suspension system on Sherman family of tanks. 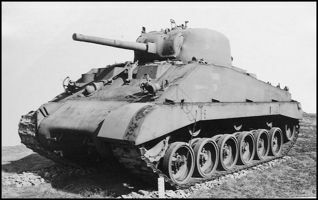 Two M4A2E4 prototypes were built in the summer of 1943. Performance of the independent torsion bar suspension was considered unsatisfactory due to severe maintenance problems which lead to the cancellation of the development. Diese Seite wurde zuletzt am 25. Oktober 2016 um 13:26 Uhr geändert.